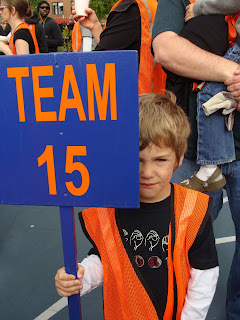 Today we were Team 15. Two small groups made this our service project. to clean up our neighborhood for the better. It's always so much more. Yes, we cleaned up a park, swept up sidewalks, spread out fresh mulch. In fact, this was the first community clean up for our neighborhood and we had the support of our city attorney and supervisor present. But we also played a round of ball, introduced and acquainted ourselves to new people. But for me, it was even more than that! Our three warriors saw a community eager to serve. They heard, 'grab that rake,' and that's what they wanted to do. They looked up to those in EPIC T-shirts and saw that they were serving and were proud to be doing the same. In an amazing way, our little boys saw themselves as equals to the young professionals who were giving up their Saturday to serve. My hope is that this is a way of life for our family. Not a special, one time event, but a lifestyle. And orange vests and large Mickey Mouse-like gloves were simply a bonus!